In order to provide an improved service and strengthen the power of news dissemination through citizen journalism, in 2012, a comprehensive program to upgrade and expand our user platform was implemented. 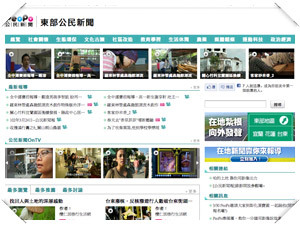 In addition to a completely new ‘Special Reports’ section and a new classification system for news stories, the platform also developed a fresh new presentation mode for news reports and further integrated social media sites (e.g. Facebook). In the area of new activities, ‘PeoPo Open House’ was launched, inviting novice CJs into the PTS studios for half-day workshops, where they got acquainted with the production process, and learned about the practical problems related to the PeoPo platform. The activities helped to increase the number of uploaded reports and built camaraderie between CJs. Meanwhile, six ‘Your Shoot’ activities held across Taiwan provided CJs with an opportunity to exchange local experiences and learn new skills. The activities consolidated interaction between old and new CJs, and helped produce a noticeable improvement in the quality of news coverage. In 2012, the ‘Upgrade CJ Reporting!’ activity was launched to deepen the interaction between CJs who have consistently delivered an abundance of high-quality reports. On top of enriching the quality of reporting, the activity also provided valuable feedback as reference for future improvements to the platform. In terms of educational resources for citizen journalists, we increased our bank of educational programs available on the internet, uploading a whole host of video lessons covering a broad spectrum of areas related to video production - equipping CJs with a comprehensive range of production skills and know-how. In regards to cooperation with NPO and NGO organizations, over the past year, facilitating communication between various social groups and the on-campus CJ community has resulted in the collaborative coverage of countless community issues, giving a voice to many vulnerable sections of the community.